Dr. Shayn Peirce-Cottler is Professor of Biomedical Engineering (BME), Professor of Ophthalmology (joint appointment), and Professor of Plastic Surgery (joint appointment) at the University of Virginia. She is also a member of the Cardiovascular Research Center (CVRC) and Associate Director of the Cardiovascular Training Grant (CVTG). 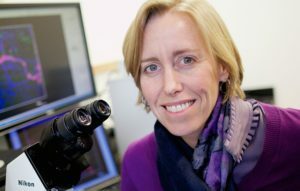 Her research focus is on tissue engineering and regeneration, computational systems biology, vascular growth and remodeling, stem cell therapies, with numerous research publications to her credit. Peirce-Cottler is Principal Investigator at UVa’s Peirce-Cottler Laboratory which uses a parallel approach that combines experimental models with agent-based computational models to guide the development of new approaches in tissue engineering and regenerative medicine. That work earned her induction to the American Institute for Medical and Biological Engineering’s College of Fellows. Peirce-Cottler teaches courses at the undergraduate and graduate levels, and has also taught lectures and seminars to Medical School students and Medical Residents. For six years, she taught the year-long BME Capstone Design course required for all undergraduates at UVA majoring in BME. She also teaches a “Introduction to Biomedical Engineering” course offered to all second year BME students at UVa, covering such topics as medical device design, regulation and commercialization, communication, professionalism and ethics. Peirce-Cottler earned her Ph.D in Biomedical Engineering from UVa, along with B.S. degrees in Biomedical Engineering and Engineering Mechanics from Johns Hopkins University.